This tough, drought-tolerant evergreen shrub is a stand-out with a dense display of vibrant red foliage, which is particularly intense in the fall and winter months. It is grown for its leathery bracts, which are actually modified leaves that typically resemble (and are often mistaken for) flowers. The bracts are long-lasting and make a unique addition to cut flower arrangements. Inconspicuous cones develop at the ends of the bracts, hence the common name Conebush. 'Winter Red' Conebush thrives here on the Central Coast of California, where the Mediterranean climate closely mimics the climate of its native region of South Africa. Reaching only 3-5 feet at maturity, it makes a good substitute for the popular Leucadendron 'Safari Sunset' in smaller gardens. As with most members of the Protea family, this plant grows best in full sun, is hardy to around 30 degrees and does not respond well to fertilizers containing phosphorus. Hi Cecil, We are very lucky on the Central Coast of California to have growers that grow and sell proteas locally to specialty nurseries and landscape contractors. Though I have never sourced plants from this nursery, an online search lead me to this company that may be able to ship to your area. 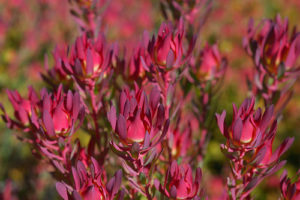 http://www.blossomvalleyprotea.com/plantsales.htm Best of luck! My winter red brackets have mostly turned gray-brown in what is now January. It is in full sun. There are still green brackets but much of the plant looks gray-brown. Should I do anything or let nature take it's course?